A weekend forest in a remote section of Milford was finally extinguished after three days on Sunday. According to Milford Fire Chief Chief Matson, the fire, located about three quarters of a mile in the woods off the Kingsbury Road, was spotted Friday after by the Maine forest Service while a plane flew over the area. Firefighters from Milford and Bradley walked into the woods with their equipment that first day and worked to contain the blaze. On Saturday, however, the fire was still burning, and the wind picked it, spreading the area being burned from roughly two to five acres. 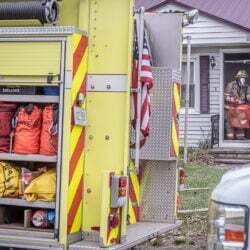 About two dozen firefighters from the various departments fought the fire, which eventually was extinguished on Sunday, although firefighters were expected to go back to the area for at least a couple days at the beginning of the week to make sure it was truly out. The cause of the fire remains under investigation, although Matson said it is believed it was caused by a lightning strike during last Thursday’s thunderstorm. Matson said it was the most difficult fire he has seen in his career to battle.